If you are looking for some recipe ideas that use Sweetened Condensed Milk, I've got just the ticket! Check out a few of my favorite dessert recipes that use my sugar free Sweetened Condensed Coconut Milk. Over 2 years ago, I created this low carb sugar free version and over the years have used it to make a number of delicious desserts like Key Lime Pie, Magical Cookie Bars, Seedy Power Bars, No Grain-ola Bars, Chocolate Hazelnut Coconut Bars, Chocolate Pecan Pie and Lemon Coconut Chiffon Fluff, to name a few. Use it to convert some of your old favorite recipes to sugar free, low carb versions. 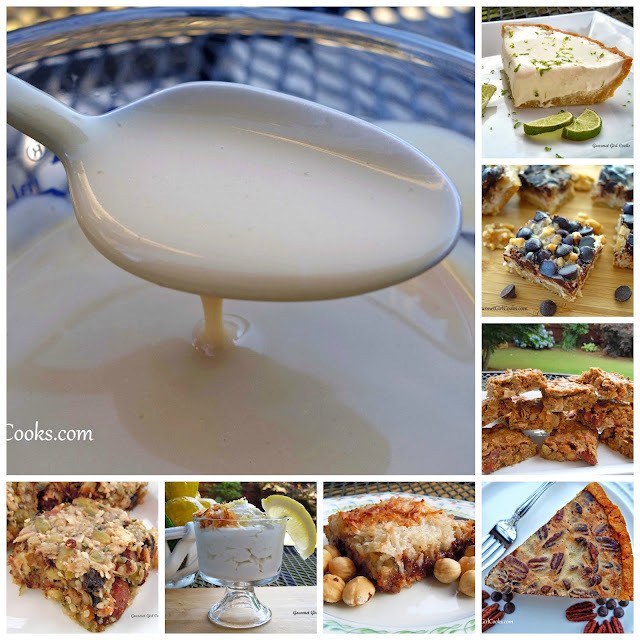 Here's the link to a few of my favorite desserts that use it: Sugar Free Sweetened Condensed Coconut Milk Dessert Recipes. Enjoy! Yayyyyy! I do love these collections. I have a big jar of sugar-free sweetened condensed milk in the fridge, so I'm going to try several of these this weekend. Suggestions for a favorite to try first?